To celebrate National Grilled Cheese Sandwich Day, I’ve decided to go all out! 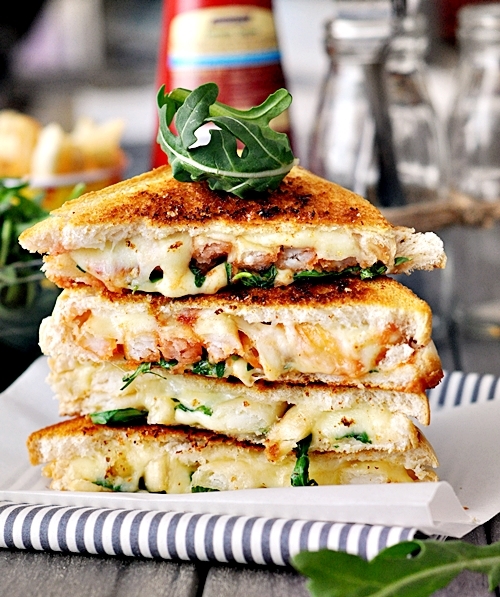 I was thinking all day about how to make a grilled cheese sandwich more glorious than it already is. Then I remembered Chip Butty. A basic Chip Butty is made with fries sandwiched between two buttered white bread slices. Since I’m not the type of lady who takes thing as it is, I tweaked the original version by marrying two of my favourite things in life, fries and grilled cheese sandwich. I must say I have been having favourable success in combining my favourite food/ingredients on one plate. Still sticking to my mantra-of-the-moment “two positives don’t necessarily result in a negative”, this grilled cheese Chip Butty has made my first celebration of the National Grilled Cheese Sandwich Day a memorable one. Hope you have a good one too! xoxo, Emily. Heat up a small pan. In the meantime, spread some butter on one side of the bread slices. Place the first slice, butter side down, over the lowest possible heat setting. 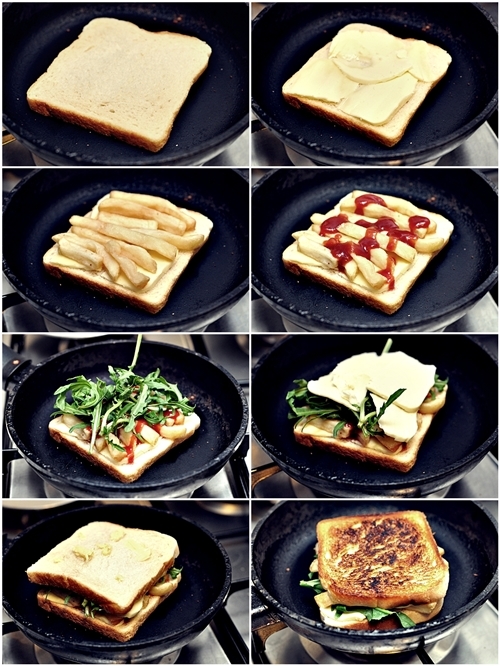 In this order, add first 4 slices of mozzarella cheese, fries, ketchup, rocket leaves, the last four slices of cheese and the other side of bread, butter side up. Press slightly with a spatula. 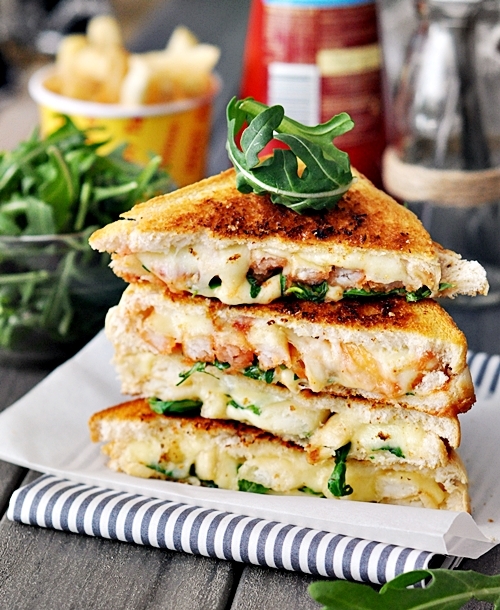 Cook until the bottom slice of bread becomes brown and cheese has melted. Then flip the sandwich over to cook the other half. Remove the sandwich from the pan and serve immediately. Looks delicious yet simple…must try! Looks so delicious! Who knows you can put french fries in sandwich! Definitely worth a try! Thanks for sharing. 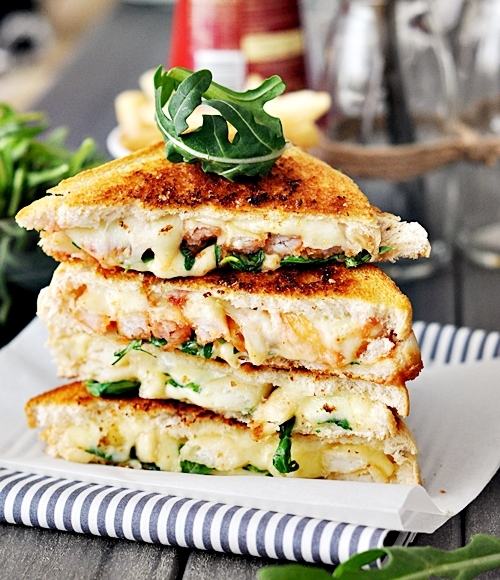 Grilled cheese and french fries? Sounds amazing. Definitely going to put this one on next week’s dinner menu. i tried it was very amazing! I finally know the name of the sandwich my dad ate all the time, Chip Butty. of course this didn’t help his clogged arteries at all. I’m going to try the grilled cheese Chip Butty tomorrow. I can’t eat too many of them or I will have a big butty! !